← Tour: What Fell Heir to the Pulps? 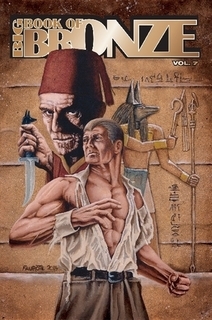 Our occasional Guest Blogger Brian Leno, hot off the release of his first book — Lovecraft’s Southern Vacation, slugging it out to keep a toehold in the Top Ten and Twenty of the Amazon Horror Litcrit Bestseller list — continues splashing the field with an article in the new issue of Big Book of Bronze, devoted to all things Doc Savage. I believe Leno details his own discovery of the iconic pulp hero. Got to love those Shock of Recognition articles. Plus you’ll find items from other names that have been dropped on These Mean Streets, such as Rick Lai and Will Murray — both fellow panelists during PulpFest where we tackled the weighty issues of the Cthulhu Mythos and the bizarre editing Farnsworth Wright was doing for Weird Tales. Will Murray, of course, has even assumed the house name “Kenneth Robeson” to keep Doc trucking in a new series of novels. I sometimes wonder if it is possible, if he keeps going and lives long enough, that Murray might eventually rack up more Doc credits than Lester Dent. . . . This entry was posted in Lit, News and tagged Big Book of Bronze, Brian Leno, Cthulhu Mythos, Doc Savage, Farnsworth Wright, Kenneth Robseon, Lester Dent, PulpFest, Rick Lai, Weird Tales, Will Murray. Bookmark the permalink.